This condition is quite common in dogs although it is very rare in cats. It is really a type of stroke that affects the spinal cord instead of the brain. In this case the stroke is caused by small pieces of disc material that somehow get into the blood vessels supplying the spinal cord to cause a blockage. Clinical signs are therefore very sudden in onset and often cause immediate paralysis of one limb, of the rear limbs or sometimes of all four limbs. The animals may be painful initially but the pain usually resolves completely within a few hours. Diagnosis depends on ruling out other potential causes of the signs such as a fracture or disc disease. There is no treatment although physical therapy has been shown to influence recovery favorably. The completeness of the animal’s recovery depends mainly on how much of the spinal cord has been damaged by the injury and this is best determined by a neurological examination. Figure 12: MRI from a dog that became acutely paralyzed after jumping down several steps. There is a local area of spinal cord swelling with fluid accumulation centrally that shows as a light-colored area (arrow). A post mortem that confirmed the injury had been caused by a fibrocartilaginous embolism (FCE). The prognosis is good for most dogs with FCE unless a large area of the spinal cord is affected. Complications that may occur in more severely affected dogs include incontinence and injury to the paralyzed limb. Fibrocartilaginous embolism of the spinal cord in dogs: review of 36 histologically confirmed cases and retrospective study of 26 suspected cases. Cauzinille L, Kornegay JN. J Vet Intern Med (1996) 10:241-5. Magnetic resonance imaging findings in spinal cord infarction in three small breed dogs. Grunenfelder FI, Weishaupt D, Green R, Steffen F. Vet Radiol Ultrasound. 2005 Mar-Apr;46(2):91-6. 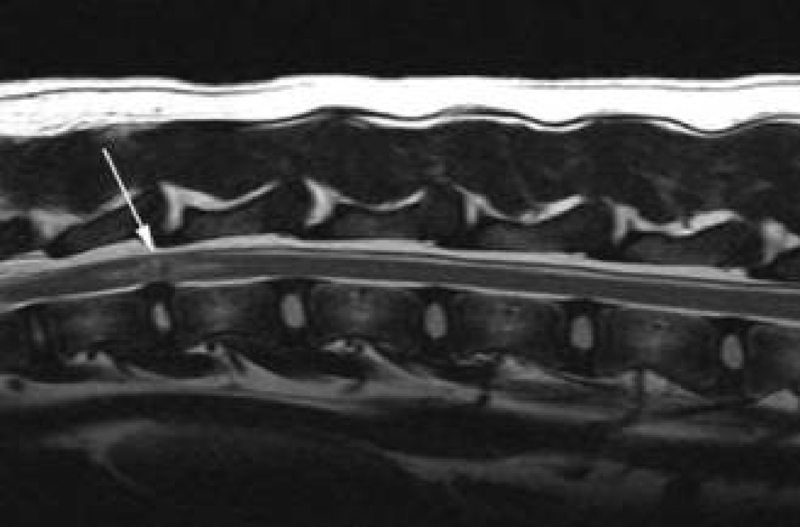 Fibrocartilaginous embolic myelopathy in miniature schnauzers. Hawthorne JC, Wallace LJ, Fenner WR, Waters DJ. J Am Anim Hosp Assoc. 2001 Jul-Aug;37(4):374-83. Fibrocartilaginous embolism–an uncommon cause of spinal cord infarction: a case report and review of the literature. Han JJ, et al. Arch Phys Med Rehabil. 2004 Jan;85(1):153-7. Fibrocartilaginous embolism of the spinal cord: a clinical and pathogenetic reconsideration. Tosi L, et al. J Neurol Neurosurg Psychiatry. 1996 Jan;60(1):55-60. Acute-onset nontraumatic paraplegia in childhood: fibrocartilaginous embolism or acute myelitis? Davis GA, & Klug GL. Childs Nerv Syst. 2000 Sep;16(9):551-4. Natural history of spinal cord infarction caused by nucleus pulposus embolism. Toro G, et al., Spine. 1994 Feb 1;19(3):360-6.